You can haz this cheeseburger anytime. 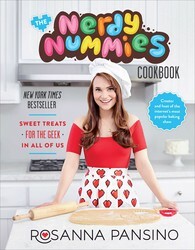 From The Nerdy Nummies Cookbook. A good joke can spread throughout the Internet between the time you go to bed and the time you wake up, leading to an inbox filled with funny pictures. These viral images are often referred to as “memes” and have been a mainstay of the Internet for many years. 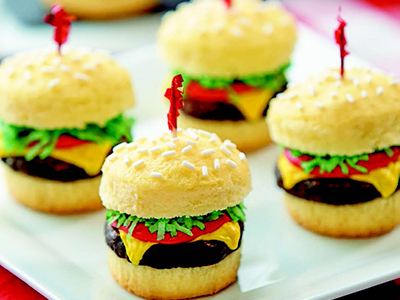 Some of the earliest memes were jokes about cheeseburgers and have been transformed into these tasty cupcakes. You can haz as many as you’d like. 1. Bake the Brownie batter in a 9 x 13-inch metal baking pan as directed. Let cool completely in the pan. 3. Prepare the Butter Cake batter and divide it among the muffin cups, filling each one two-thirds full. 4. Bake until a wooden pick inserted in the center of a cupcake comes out clean, 18 to 20 minutes. 5. Let the cupcakes cool completely before decorating. 6. Use the round cookie cutter to cut out “hamburger patties” from the brownies. 7. Halve the cupcakes horizontally with a straight edge (not serrated) knife. 8. Place the brownie burgers on the bottom halves of the cupcakes. 1. Mix half of the buttercream frosting with yellow food coloring until it is the color of cheese. Scoop the frosting into a decorating bag fitted with a #48 tip and pipe it to look like cheese slices on your patties. 2. Tint the other half of the buttercream frosting with red food coloring until you reach the desired shade of bright red. Scoop the frosting into a decorating bag fitted with a #10 tip and pipe it to look like a tomato on top of the cheese. 3. Mix the flaked coconut with liquid green food coloring until it is light green, resembling lettuce. Sprinkle the coconut flakes on top of the red frosting. 4. Place the top half of each cupcake on top. 5. Scatter white sprinkles on top of the cupcakes to look like sesame seeds. I use baking tweezers for more control. 1. In a medium bowl, whisk together the sugar, flour, cocoa powder, baking powder, and salt. 2. Add the oil, milk, vanilla, and egg. Whisk until well combined. 1. In a large bowl, whisk together the flour, almond meal, baking powder, and salt. Set aside. 2. In a second large bowl, with an electric mixer, beat the butter until softened. Add the superfine sugar and beat until light and fluffy, 3 to 5 minutes. Scrape down the sides of the bowl as needed. 3. Beat in the vanilla. 4. Add the eggs, one at a time, beating well after each addition. Scrape down the sides of the bowl as needed. 6. Pour the batter into the prepared pan and spread evenly. Tap the bottom of the pan on the work surface to get rid of any air bubbles.